Jamie Ferguson is a percussive acoustic guitarist based in Manchester, UK. With influences from Andy McKee, Red Hot Chili Peppers through to Calum Graham and Jon Gomm, Jamie’s style combines percussive techniques, fingerpicking, and inventive harmonics to achieve an impressive and exciting style of music. Personal goals and determination are key components to Jamie’s work as he is focusing on becoming a successful solo artist through percussive acoustic guitar. 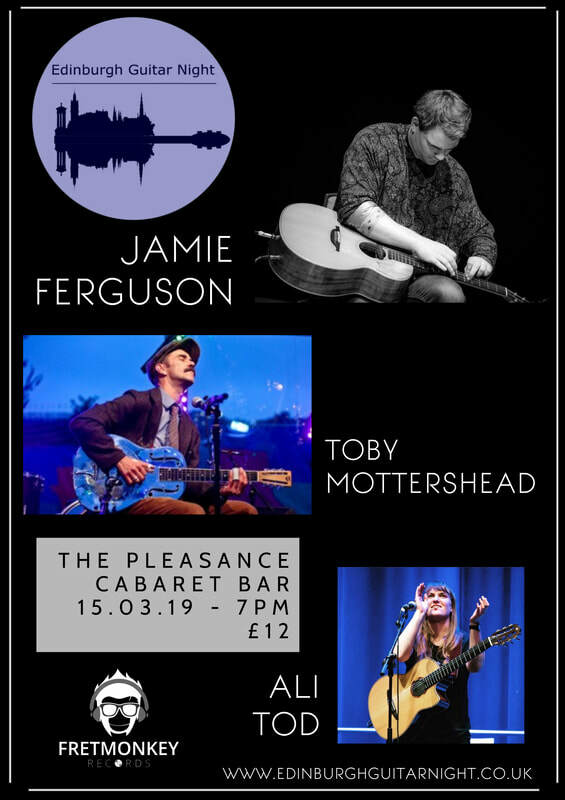 Jamie has also accompanied and supported artist George the Poet as a session guitarist playing for B Franklin on his UK tour; performing at sold-out venues from Glasgow O2 to The Everyman Cinema in London. Following the UK tour, Jamie has also featured on Sofar Sessions in London, as well as playing as a session musician for SB TV. Inspired by the old-time blues, roots, ragtime and gospel of the pre-war era. Toby Mottershead earned his spurs playing with the award winning eight piece band The Black Diamond Express. His solo show on The Roots of The Blues is an exceptional gem of The Edinburgh International Festival - showcasing his obsession with artists such as Blind Willie McTell, Robert Johnson, Mississippi Fred McDowell and many more. Ali is the founder and organiser of the Edinburgh Guitar Night. Having performed in Guitar Nights and festivals across the UK, Ali identified the need for something similar to happen in her native Scotland, and thus the Edinburgh event was born.